Surrey fast bowler Tom Curran has signed a new contract with the club, which will keep him at The Oval until the end of 2018. The 20-year-old took 105 wickets in all competitions this season and has been called up to the England Performance Programme squad. The South Africa-born right-armer was also named the Professional Cricketers' Association's young player of the year. "I am excited to build on the work we've done this year," he said. 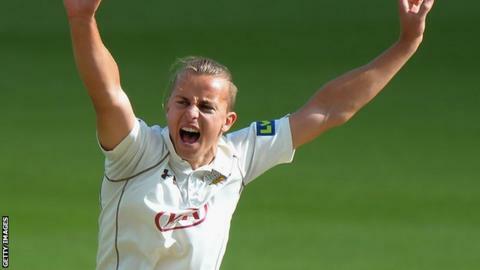 Curran took 76 County Championship wickets at an average of 23.07 this year as his side won the Division Two title, finishing the campaign as the joint leading wicket-taker alongside Mark Footitt of Derbyshire. He took a further 15 in the One-Day Cup, in which Surrey were beaten by Gloucestershire in the final, and 14 in the T20 Blast. Curran is due to complete his residential qualification to play for England at the end of October. He will travel with the England Performance Programme squad to South Africa and Dubai in November. "Tom's performances this year have been quite outstanding," Surrey director of cricket Alec Stewart told the club website. "He has a very bright career ahead of him with Surrey and I know the England selectors are already keeping a very close eye on him."